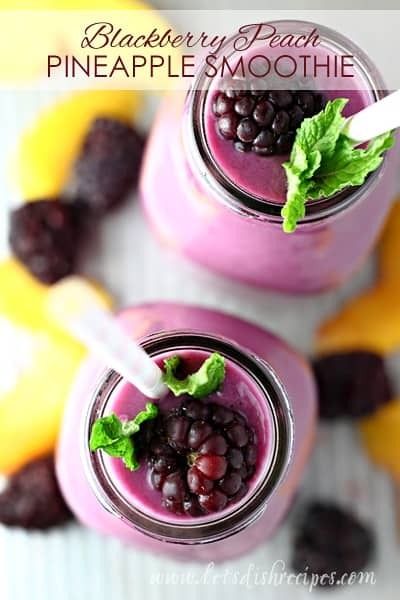 BLACKBERRY PEACH PINEAPPLE SMOOTHIE — Frozen peaches and blackberries combine with yogurt, pineapple juice and fresh bananas in this healthy smoothie recipe. 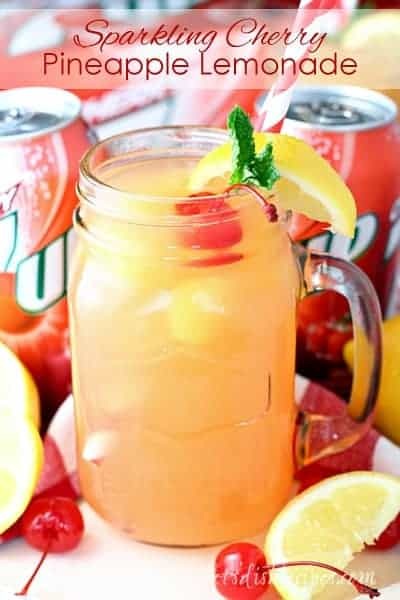 I love starting my day off with a refreshing fruit smoothie. It really puts me in the mood for healthy eating for the rest of the day. 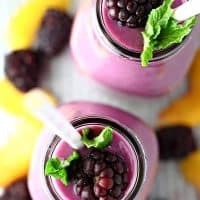 This Blackberry Peach Pineapple Smoothie is one of my favorites, and although you don’t really need a recipe to make a smoothie, I thought this one was worth sharing! I like to keep a variety of frozen fruit on hand, just for making smoothies. In fact, if I have a handful of berries or other fruits that I know won’t get eaten, I toss them into zip top bags and throw them in the freezer. Then I have frozen fruit ready to go whenever a smoothie craving strikes! I usually add at least one banana, and some yogurt to all of my smoothies. You’ll also need some liquid. Depending on the smoothie, juice, water, or even milk all work well. 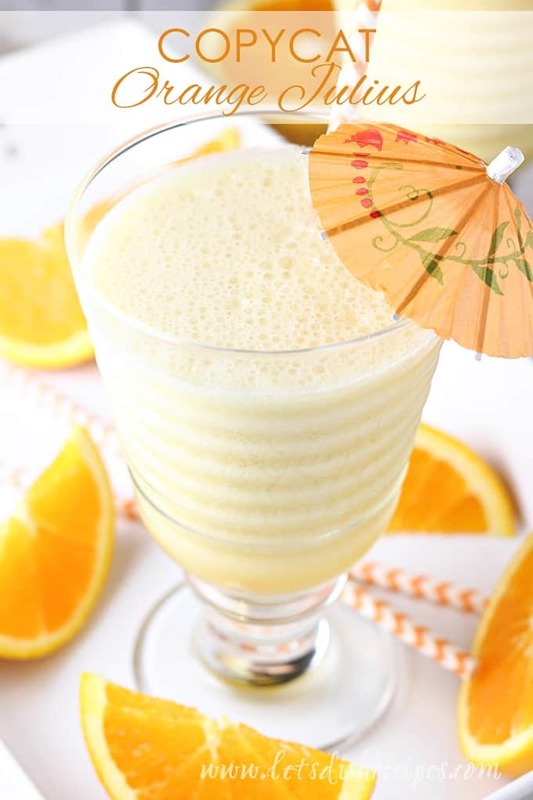 I just happened to have some pineapple juice on hand when I made this smoothie, and I liked it so much, I’ve started keeping it in my pantry just for smoothie making. Of course, smoothie recipes are highly adaptable, so if you like more or less of something, or want to sub one fruit for another, feel free to do so. Some folks like a nice, thick smoothie, while others prefer something a little more drinkable. Simply adjust the amount of liquid used to get your smoothie to the perfect consistency for you. I really do love this blackberry and peach combination though. 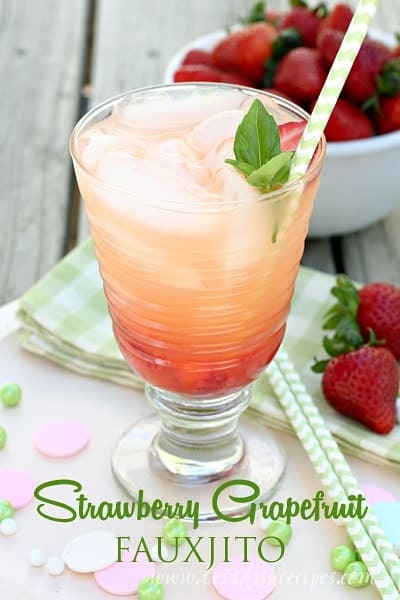 With a fun straw and a sprig of fresh mint for garnish, this smoothie is the perfect way to start your day! Be sure to save this Blackberry Peach Pineapple Smoothie recipe to your favorite Pinterest board for later. 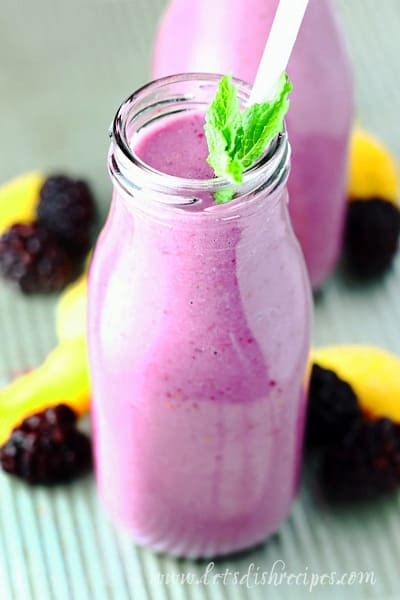 Frozen peaches and blackberries combine with yogurt, pineapple juice and fresh bananas in this healthy smoothie recipe. Place all ingredients in blender and puree until smooth, add more liquid, if needed, until smoothie reaches desired consistency.